DeZURIK KGN Knife Gate valves are available as a bi-directional resilient seated valve or a unidirectional metal seated valve. KGN-RSB Bi-Directional Resilient Seated Knife Gate Valves are designed for isolation, on-off applications in corrosive, abrasive liquid applications in Pulp & Paper, Mining, Waste Water, Chemical, Petrochemical, Power and Steel. 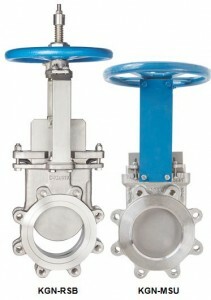 The KGN-RSB provides bubble tight shutoff in both directions up to the full rating of the valve. KGN-MSU metal seated unidirectional Cast Stainless Steel Knife Gate Valves are designed for applications in corrosive, abrasive liquid slurry or dry material applications including: Pulp & Paper, Mining, Waste Water, Chemical, Petrochemical, Power, Steel, etc. All KGN valves feature a cast, corrosion resistant stainless steel body and packing gland. The gate and stem are also stainless steel; the superstructure is stainless steel with an option of carbon steel on metal seated valves.